Charlie Lennon is one of the most prolific living Irish tune composers and he has also written some ambitious large scale works with orchestras. He was named TG4 Composer of the Year in 2006. He has published a book of tunes Musical Memories. A second book is to be published in 2012. Some of Charlie's most played and recorded tunes include The Twelve Pins, Lennon's No.4, The Smiling Bride, The Road to Cashel and The Handsome Young Maidens. His official biography is found below. Born in Kiltyclogher, north county Leitrim, Charlie started piano at age seven. 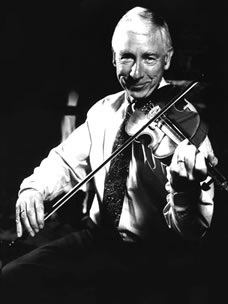 He also started on fiddle, taught by his brother Ben, who brought him through the music of the Sligo masters Coleman, Killoran, Morrison and Gillespie. He went on to study classical violin in his late teens as well as studying classical and jazz harmonies. From age seventeen Charlie was a professional musician playing with several céilí bands, variously on piano, fiddle, drums and double bass. At twenty-two Charlie enroled at Liverpool University, eventually securing a Doctorate in Nuclear Physics. While in Liverpool he played with the ‘Liverpool Céilí Band’ from 1960 to 1968. The ‘Liverpool’ won two All-Ireland titles, recorded two albums with Decca and toured in the United States. In 1969 he moved back to Ireland with his wife, sean-nós singer, Sile Ni Fhlaithearta from Spiddal. In the late 1970s Charlie began composing tunes in a serious way, most of which ended up in the book of his compositions Musical Memories (Waltons) released in 1993. His recordings include Lucky in Love (with Mick O’Connor), The Emigrant Suite, Flight from the Hungry Land (from which the show and video Waves was taken), Island Wedding, Time for a Tune and Turning the Tune. Many famous Irish musicians and bands have recorded his tunes, including: De Dannan, Liam O’Flynn, Kevin Burke, Sharon Shannon, Altan and The London Lasses and Pete Quinn. Along with his brother Ben, and Ben’s sons Brian and Maurice, he recorded the album Dance of the Honey Bees. He also appears on Ben’s solo album The Natural Bridge. Charlie has been piano accompanist on over twenty-five albums, among them Omos do Joe Cooley with Paul Brock and Frankie Gavin and The Bucks of Oranmore with Joe Burke.